ASHLEE SIMPSON DAILY | Your Source about Ashlee Simpson! Ashlee and Evan’s Q&A on Twitter! Hello everyone! Today (April 18), Ashlee Simpson Ross and Evan Ross made a little Q&A on Twitter. Find the videos with the questions below. 1) What is the last song you listened to ? The last movie you saw ? And last TV Show you saw ? 2) Which of Ashlee’s solo songs would you both love to redo as a duet together? 3) When was the first time you heard each other sing in person? 4) You both have incredible fashion senses, do you take fashion advice from each other or do your own thing? 5) What’s one song you’ve worked on together that you love, but we haven’t heard yet? 6) Ashlee, as you begin your new album, which type of vibe do you think this new project will have ? 7) If you could collaborate with anyone of your choosing, who would you pick and why? 8) Do you have similar music taste (as fans of music) or are your music tastes completely different? 9) What’s your favorite part about creating music together? 10) Are you guys going to tour and release music again either together or separate this year? 11) Will you both be visiting the UK anytime soon? Hello everyone! On Sunday (April 13), Ashlee Simpson Ross and Evan Ross enjoyed the ‘Coachella’s Neon Carnival Bash‘ in Thermal. You will also find a little video where we can see Ashlee and Evan. Ashlee spoke with EOnline about the music festival : “I feel at Coachella you can bring out your bohemian vibes. Bring the long necklaces out,” Ashlee Simpson-Ross shared with E! News while attending Lucky Brand and Rolling StoneLive’s Desert Jam party. “I’m keeping it chill. The music and everything is super fun.” She also mentioned her husband saying “Evan is always next level”. Ashlee & Evan at Coachella – Day 2! Hello everyone! Yesterday (April 13), Ashlee Simpson Ross and Evan Ross were at the ‘Launch of CÎROC Limited-Edition Summer Watermelon at the CÎROC Summer House’ at Korakia Pensione and at the ‘Lucky Brand And Rolling Stone Live Present Desert Jam’ at ARRIVE Hotel in Palm Springs during the Coachella Music Festival. Ashlee looks stunning. Ashlee and Evan at Coachella! Hello everyone! Yesterday (April 12), Ashlee Simpson Ross and Evan Ross attend the ‘NYLON’s Midnight Garden Party’ at Coachella in Bermuda Dunes. New videos of Jagger Snow! Ashlee Simpson And Evan Ross On The Reality Of Traveling With Kids! 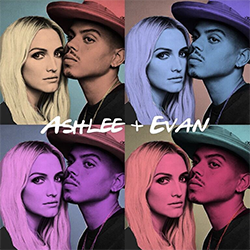 Ashlee Simpson Ross and Evan Ross have a lot going on. They released a new album, starred on a reality show, went on tour, and just welcomed a new niece into their lives. So, when they get the chance to take a break with their kids, they jump on the opportunity. That’s why the two jetted off to Mexico twice this year already and are hoping to check off some bucket list destinations soon. But, for now, they’re back to work (in case you missed it, they launched a new single last month) and jump at the chance to support new, unexpected collaborations in music when they can. I caught up with the music couple over the phone while they were attending the album drop party on April 3 for Febreze’s debut album, The Freshness, a compilation of the brand’s most buzzed about musical radio ads that was created due to fans clamoring on social media for an album. Here’s what they had to say about touring with family, dealing with kids on a plane, and Jessica Simpson’s candidness about her pregnancy. Q: You two are pro musicians. What attracted you to come out and support a Febreze album? Evan: It’s a fun thing. Music doesn’t have to be so serious. Sometimes it’s just for the fun of it, and if people are enjoying it, you should give the fans what they want. Ashlee: Plus, anytime I’m cleaning I feel like I am coming up with a little song. You can find inspiration in any moment. Q: Now, you two have been on tour recently together. How has that been mixing work and personal life? Evan: The best part is the fact that we get to be with each other. It could be a lonely process taking you far away from your family. In this circumstance, we were able to be with our family and children and have a good time. Every day we got to feel like we were still at home because home is where the heart is. Q: That’s great you got to be with family. But, traveling with kids can be tough. Ashlee: They were amazing and loved it. Our daughter would always sing the last song with us and would be so excited. She would stay up really late waiting for it, and it was so sweet. Q: Now, you two travel quite a bit with your kids. What are your tips for traveling with children? Ashlee: I don’t even know if there are tips because it’s impossible to tell what your child will do. Sometimes, like us, you have the screamer. [Jagger] has had her moments and now she’s really chilled. But she’s definitely been that kid on the plane. Evan: If I could give you advice, I would say don’t feel sorry about the fact that you have a kid. Sometimes it’s one of those things. We still embarrassed and are concerned about how loud our child is, but they’re children at the end of the day. It is what it is. Q: So, you’ve gotten those looks on the plane? Evan: Oh yes! I’ve had to lift my baby up sometimes and say, “We’re not hurting her. She’s just screaming.” Now that she’s older, she’s ok. They go through different phases. Q: And you recently got back from vacation. I believe from Mexico, correct? Evan: Yeah. We’ve been a little bit too much. Q: Is that a special place for you guys? Evan: It’s just so close! But in between the busy times, it’s important to find time just to be worried about work. That was the way I grew up. My mother would find that time between work and make it quality time. Ashlee: And my mom was with us in Mexico. So, it was really great to have more of the family. Q: Do you have any bucket list destinations? Evan: We want to go to Switzerland. I grew up in Switzerland, and I would go skiing every day with my father. I would love to take Ashlee and the kids out there. I also would love to go to Africa and Norway as well. Ashlee: I mean I’m ready to go! Q: How do you keep in touch with extended family when you’re traveling so much? Evan: I think people forget how large my family is. I have 10 siblings; some are in Europe, some are here, etc. But, we have a family group text to keep in touch. Ashlee: I get to see my family and Jessica all the time. I’m lucky. Q: And speaking of family. Jessica just had a baby. Congratulations! Ashlee: Yes, she’s so cute. Q: Now, during her pregnancy, she was so candid about motherhood. How does that make you feel like as a sister? Ashlee: Jessica and I both to each other are always very candid. And I thought what she did and talking about it for every woman out there is so important. Not every pregnancy is the same, and I think it’s so beautiful that she was able to talk about it and that’s what you can relate to. You don’t always look cute and feel good during pregnancy. I never did. Evan: I’ve always had respect for her. She doesn’t take anything too seriously, and she allowed herself to look at it in a positive way. It’s okay that things aren’t always perfect all the time. I think the way she shows her life like that is so special. You never know what challenges you’ll face and I respect her for sharing that. Ashlee: And when I get pregnant again and who knows what I’ll go through. But it’s important for her to share that. Proud aunt! Ashlee Simpson’s newest niece arrived last month, and she told Us Weekly exclusively that she can’t get enough of baby Birdie. Jessica Simpson and her husband, Eric Johnson, who already share Maxwell, 6, and Ace, 5, welcomed their third child on March 19. Not only do Ashlee’s children, Bronx, 10, and Jagger, 3, “love” their infant cousin, but the “Pieces of Me” singer told Us that Jessica’s kids are just as infatuated with Birdie. “Best brother and sister for sure,” she said. While the Out of the Shadow and Into the Spotlight author and her husband, Evan Ross, weren’t in the hospital room during Birdie’s birth, they visited the fashion designer, 38, afterward. Ashlee praised her older sister for being such a trooper throughout her difficult pregnancy. The Dukes of Hazzard actress opened up to her Instagram followers all pregnancy long, documenting everything from her swollen feet and multiple bronchitis hospitalizations to extreme acid reflux and sciatica pain. “The one thing that gets me through this pregnancy is knowing I will get another one of these cuties,” she captioned a February Instagram pic of Maxwell and Ace hugging. Febreze released The Freshness, a compilation of the brand’s musical radio ads, last month. New interview of Ashlee and Evan! Hello everyone! Ashlee Simpson Ross and Evan Ross gave an interview to Getty Images during their last event for ‘Febreze’. Ashlee mentions her solo album and she seems to be very happy about it, can’t wait to listen to her new songs. Plus, find a little video of Ashlee and Evan with their nephew, Raif-Henok for Access. Ashlee and Evan at the album Launch Party for the Freshness by Febreze + Ken Paves’s Event in Los Angeles! Hello everyone! Yesterday (April 3), Ashlee Simpson Ross and Evan Ross attended the ‘Album Launch Party for the Freshness by Febreze’ in Los Angeles. Ashlee looks so gorgeous! On Tuesday (April 2), Ashlee Simpson Ross and Evan Ross were at the Ken Paves x Skinade event in Los Angeles. Ashlee and Evan’s contest #PhasesChallenge! Hello everyone! 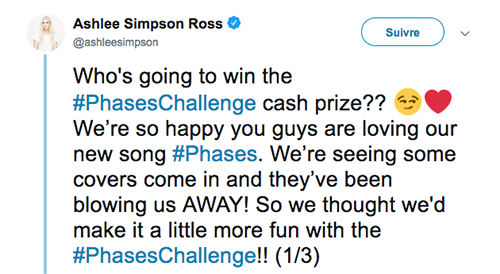 Ashlee Simpson Ross and Evan Ross are organizing a contest for their fans. All you have to do is post your cover on Instagram, Twitter, or Youtube by April 15th using the hashtag #PhasesChallenge. Then Ashlee and Evan will pick a winner and post your cover across all of their social accounts and give you $500. Link to the instrumental version here. The contest is worldwide. Good luck!